STUART, Fla. — State Rep. Toby Overdorf has filed an appropriations bill that aims to give Stuart residents cleaner drinking water. The bill , if passed, would provide a minimum of $500,000 from the state of Florida for the city of Stuart to put toward developing a new water supply. The city wants to eliminate PFOAs and PFOS from drinking water, which have been linked to contributing to major health issues, such as cancer, following long term exposure. “I was worried for the citizens of Stuart. I was really concerned about the long-term implications,” Overdorf said. Right now, the EPA's Health Advisory Limit for exposure is 70 parts per trillion to provide Americans, including the most sensitive populations, with a margin of protection from a life time of exposure to PFOAs and PFOS from drinking water, according to the EPA. City representatives say the current contamination levels are typically well below that advisory level, around 40-50 parts per trillion. Overdorf and city leaders worry the EPA health advisory level will continue to drop. Therefore, they want to bring the level of contamination to levels that are nearly untraceable. But, that comes at a major cost and might not be completely possible. That is why they are planning for the likelihood of drilling a new water source entirely. "The wells right now are at a position where they’re currently quote on quote safe according to the standards and we’re worried about those standards changing,” Overdorf said. “We wouldn’t have any warning associated with it. Just the standards will change and they’ve already changed in other states to lower levels." PFOAs, according to the city, seeped into the city’s ground and drinking water through firefighter foam. The fire suppression agent was used for decades by firefighters locally and around the world, until PFOAs and PFOS were phased out of production in the United States more than a decade ago. However, the compounds can stay in the environment for years. That’s why Overdorf is confident Stuart might not be the only city looking for help with cleanup costs in the near future, if more cities discover contamination. Stuart took a proactive approach in looking for PFOA contamination, after suspecting the firefighter foam might have contributed to contamination. The highest levels detected in the city were near the city’s firefighter training complex. 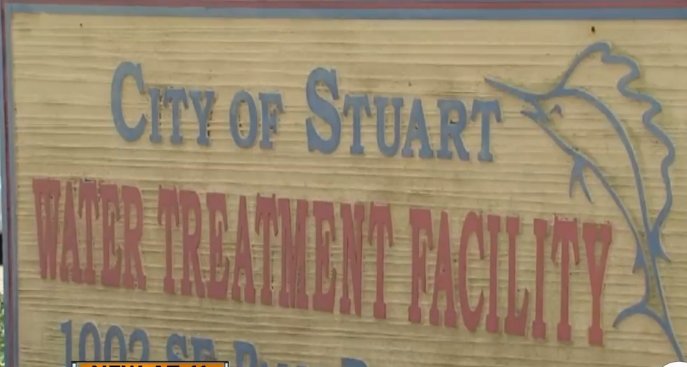 “The city of Stuart is one of a multitude of cities and we don’t even know how many areas are contaminated now within the state,” said Overdorf.